Optimizing Safety Stock levels by calculating the magical balance of minimal inventory while meeting variable customer demand is sometimes described as the Holy Grail of inventory management (ok, forecasting is probably the true holy grail but I thought this sounded good). Many companies look at their own demand fluctuations and assume that there is not enough consistency to predict future variability. They then fall back on the trial and error best guess weeks supply method or the over simplified 1/2 lead time usage method to manage their safety stock. Unfortunately, these methods prove to be less than effective in determining optimal inventory levels for many operations. If your goal is to reduce inventory levels while maintaining or increasing service levels you will need to investigate more complex calculations. Normal distribution. Term used in statistical analysis to describe a distribution of numbers in which the probability of an occurrence, if graphed, would follow the form of a bell shaped curve. This is the most popular distribution model for determining probability and has been found to work well in predicting demand variability based upon historical data. You can also use Excel function STDEVPA to calculate standard deviation. In safety stock calculations, the forecast quantity is often used instead of the mean in determining standard deviation. Lead time. Highly accurate lead times are essential in the safety stock/reorder point calculation. Lead time is the amount of time from the point at which you determine the need to order to the point at which the inventory is on hand and available for use. It should include supplier or manufacturing lead time, time to initiate the purchase order or work order including approval steps, time to notify the supplier, and the time to process through receiving and any inspection operations. Lead-time demand. Forecasted demand during the lead-time period. For example, if your forecasted demand is 3 units per day and your lead time is 12 days your lead time demand would be 36 units. Forecast. Consistent forecasts are also an essential part of the safety stock calculation. If you don't use a formal forecast, you can use average demand instead. Forecast period. The period of time over which a forecast is based. The forecast period used in the safety stock calculation may differ from your formal forecast periods. For example, you may have a formal forecast period of four weeks while the forecast period you use for the safety stock calculation may be one week. Demand history. A history of demand broken down into forecast periods. The amount of history needed depends on the nature of your business. Businesses with a lot of slower moving items will need to use more demand history to get an accurate model of the demand. Generally, the more history the better, as long as sales pattern remains the same. Order cycle. Also called replenishment cycle, order cycle refers to the time between orders of a specific item. Most easily calculated by dividing the order quantity by the annual demand and multiplying by the number of days in the year. Reorder point. Inventory level which initiates an order. Reorder Point = Lead Time Demand + Safety Stock. Service level. Desired service level expressed as a percentage. Service factor. Factor used as a multiplier with the Standard Deviation to calculate a specific quantity to meet the specified service level. 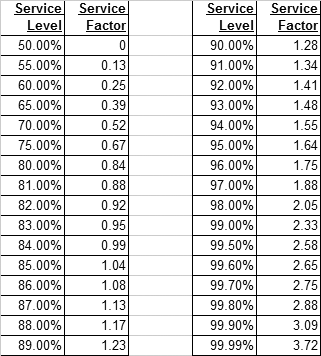 I have included a service factor table below or you can use Excel function NORMSINV to convert service level percentage to service factor. As mentioned previously, an understanding of the statistical theory behind this formula is necessary to ensure optimal results. The statistical model uses the standard deviation calculation to describe the probability of a number occurring in reference to the mean in a normal distribution. A table is then used to determine a multiplier to use along with the standard deviation to determine ranges of numbers which would account for a specified percentage of the occurrences. The multiplier is referred to as the number of standard deviations required to meet the percentage. The theory states that zero standard deviations added to the mean will result in a number in which 50% of the occurrences will occur below, one standard deviation added to the mean will result in a number in which 84% of the occurrences will occur below, 2 standard deviations added to the mean will result in a number in which 98% of the occurrences will occur below, and 3 standard deviations added to the mean will result in a number in which 99.85% of the occurrences will occur below. In the safety stock calculation we will refer to the multiplier as the service factor and use the demand history to calculate standard deviation. In its simplest form this would yield a safety stock calculation of : safety stock = (standard deviation) * (service factor). If your lead time, order cycle time, and forecast period were all the same and if your forecast was the same for each period and equaled the mean of the actual demand for those periods, this simple formula would work great. Since this situation is highly unlikely to occur you must add factors to the formula to compensate for these variations. This is where the trouble lies. You must add factors to adapt this theory to work with your inventory, however, each factor you add compromises the integrity of the original theory. This isn't quite as bad as it sounds. While the factoring can get complicated you can keep tweaking it until you find an effective solution. Your final formula will look like: safety stock = (standard deviation)*(service factor)*(lead-time factor)*(order cycle factor)*(forecast-to-mean-demand factor). There is not a general consensus on the formulas for these factors; in fact, many calculations do not even acknowledge the need for them. I will give some recommendations for these factors, however, I strongly suggest you test and tweak them with your numbers to arrive at something that works for you. Lead-time factor. This is necessary to compensate for the differences between lead time and forecast period. The standard deviation was based on the forecast period, a factor is necessary to increase or decrease the safety stock to allow for this variance. A formula you can try is lead time factor = square root (lead time/forecast period). Order cycle factor. Since longer order cycles result in an inherent higher service level you will need to use a factor to compensate for this. A formula you can try is Order cycle factor = square root (forecast period/order cycle). This is a simple calculation that works sometimes, but I typically use a more complex calculation (different logic completely)for this factor. Forecast-to-mean-demand factor. Remember that the original statistical model was based upon the mean of the distribution. Substituting a forecast for the mean in the calculation of standard deviation creates a problem if the forecast mean and the actual demand mean are not close and also if the forecast varies between forecast periods (seasonality, sales growth). Sorry but I don't have a canned formula for this one that I feel confident enough with to publish. The actual formula used will vary based upon the types of variances and the method for standard deviation calculation used. Minimum Reorder Point. For slow moving products and especially if the lead time is short, you may want to program in a minimum reorder point which is the equivalent of one average sale. Lead-time Variances. You may have noticed that I have only discussed demand variations in this model. While you can use this model for predicting variations in supply, I have found that supply variations tend to be far too random and unpredictable. Supply problems tend to be related more to a vendor than an item and the severity of the variations do not fall into the pattern of a normal distribution. The safety stock calculated for demand variation will also cover for some supply variations, however, the best way to deal with variable supply is to have a high level of communication with the vendor and not to count on safety stock. You may find that certain items which are critical to your operation may require a safety stock calculation based upon the nature of the supply chain of the specific item. While all of these factors and their potentially detrimental effect upon the integrity of the original formula may leave you feeling less than confident with the results of this model, you should realize that these factors would be necessary in any method of calculating safety stock which takes a scientific approach to meeting service levels while maintaining minimal inventory levels. It is very important to thoroughly test the model prior to final implementation to ensure it is working correctly and to determine impact on inventory levels and cash flow. It's also a good idea to start with a higher service factor initially and gradually reduce it until your actual service levels meet your objectives. You will never find perfection in determining probability, however this type of formula is certainly more effective than the previously mentioned keep it simple approaches. For more detailed information on Safety Stock check out my book Inventory Management Explained. In the book I provide a much more thorough discussion of the logic as well as additional suggestions for adjustments. You may also want to check out my article on Dependent Demand Safety Stock.